My time at Osa Conservation’s biological station was an incredible experience, full of birds, nature, and exploration in the tropical rainforest. 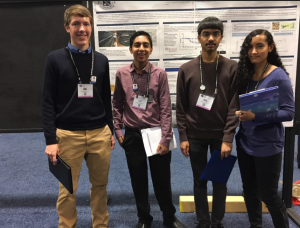 It was particularly meaningful as I got to follow up on my highschool ornithology research in the Osa and present it at the Society for Neuroscience conference in Washington, D.C.
Over 30,000 people from 80+ countries attended the annual meeting, which filled DC’s convention center. I presented a poster that included my research on the elaborate courtship displays that manakins use to attract their mates in the Osa. As scientists walked by my scientific poster, they were eager to learn more about my findings! As a part of my summer research, I hiked the trails around the biostation searching for manakin “leks” – a term used to describe the gathering of two or more males performing courtship displays. 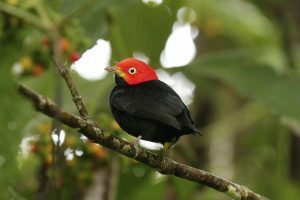 I found that for each of three manakin species found in the Osa – including Red-capped, Blue-crowned, and Orange-collared – each one frequented and displayed in different habitats. The Orange-collared Manakin lived in secondary growth forest, within meters from trees that remain from plantations that previously occupied the same land. 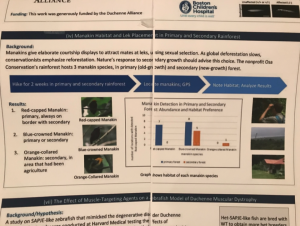 This was really interesting as it illustrates Osa Conservation’s success in reforestation and the importance of not just preserving existing rainforest, but also re-growing new rainforest, which is valuable for birds such as the Orange-collared Manakin! I also found Red-capped Manakins in primary forest, although they were near the borders with secondary growth. Blue-crowned Manakins were in both primary and well-established secondary growth rainforest. Overall, I had a great time doing my research in the Osa and enjoyed being able to present what I found in the field to bring together ornithology and neuroscience at a conference in DC! What an experience! Note: Patrick visited Osa earlier this year and is part of the Sidwell School’s Upper School’s BRAIN Club. Click here to learn more about the students and their “Biological Research and Investigations in Neuroscience” Club!